A written test held in the campus on 9th May, 2016 Monday in LT 2 and LT 4. The timing is from 6 pm onwards. There will be 50 questions on Power-point slides. Around 25 questions will be from preclinical subjects and 25 will be from clinical subjects. Each question will be flashed for 25 seconds with an indicator that time is running out. The students have to answer them individually. The answers will be usually in form of a single word/ small phrases apart from being names of things/persons. 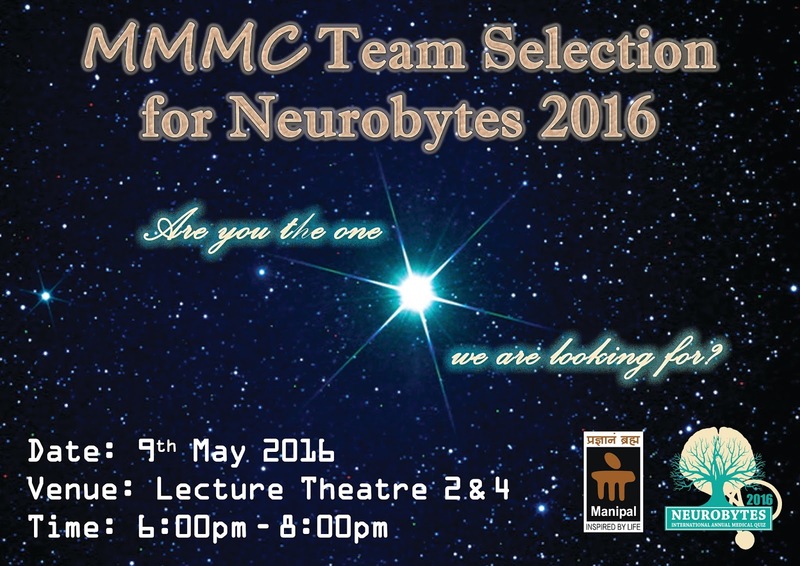 The top four students will be selected for the two teams to represent MMMC. No negative marks are alloted, so you can feel free to answer all the questions. You have to mention you name, roll no and batch no in the answer sheet provided. In event of tie, the questions from preclinical section will be used to decide the winner. The questions are vetted and will be non-controversial so no challenges will be entertained. Interested candidates please give your names to your group leaders. You will be sponsored by the college for the team registration fees. Catch you guys and gals on 9th May!! !